Although gender roles are constantly evolving and changing, when someone mentions domestic abuse, the image that often comes to mind is often a woman who is battered, bruised, and bloodied. The image of the wholesome, loving, and nurturing woman and men as the strong, protective and occasionally volatile is the idea set forth by generations before us, and is a stereotype that may be completely not what is realistic. Unfortunately, men are often the unspoken victims of domestic abuse. Wait! Men Are Bigger And Stronger! 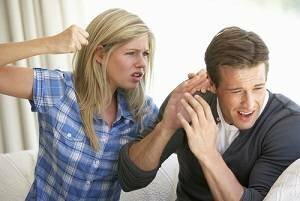 Men often do not report domestic violence in the home. Many are worried about being laughed at, ridiculed, and, worse, not even believed due to the overwhelming stigma associated with domestic abuse of males. A large number may feel that they are typically physically larger and more muscular than the female counterpart. However, abuse, no matter what the size and physical capabilities of the victim or the abuser, is still abuse. No one should have to suffer from the effects of such poor treatment. The law does not discriminate, so neither should the courts. In severe cases, those with reports of being beaten, burned, choked, kicked, slammed with a heavy object, or hit with a fist, 40% of victims were males. Not limited to the visible physical harm, can be mental and emotional. If the couple has had a child together. If you are a victim of domestic abuse, it is imperative that you speak up to defend yourself, or your family. Whether it be protective orders, divorce papers, or custody hearings, it is helpful to have a lawyer on your side. Having the right lawyer for your situation can make the difference between winning and losing, in turn affecting the futures of everyone involved. If you are suffering from domestic violence and would like to discuss your options with a knowledgeable and effective San Jose, CA family lawyer, contact The Law Offices of Steven E. Springer today at one of our three convenient locations, in San Jose, Morgan Hill and Fremont. Call us today at 408-779-470 or 510-791-7137 to schedule your free 20 minute consultation. With more than 30 years of combined experience in dealing with situations just like yours, we have seen most of what the courtroom has to offer and will use that knowledge to help you get the outcome you deserve.